New Brookings report lists top cities for 'advanced industries.' Fancy degree not needed. Got a bit of tech savvy and want a high-paying, high-growth job? There's a city for you. 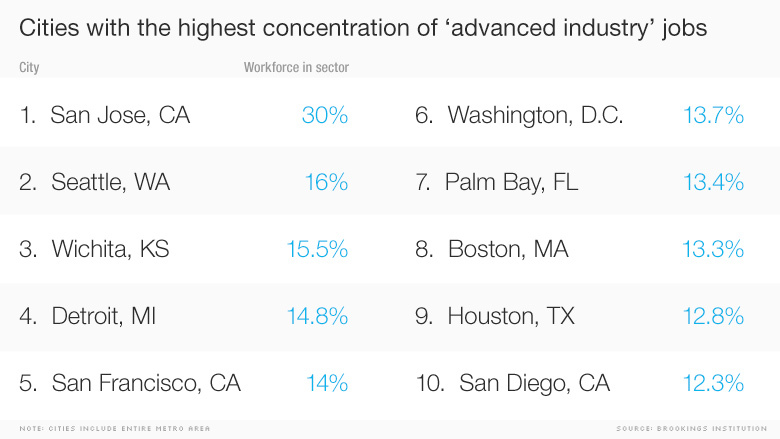 A new report from the Brookings Institution ranks America's cities according to the percent of the workforce employed in what it calls "advanced industries." This means the industry spends a lot on R&D and has a high number of workers in science, technology, engineering and math-oriented roles. Some of these cities are intuitive. San Jose, with nearly twice the advanced industry jobs per capita as second-ranked Seattle, is the heart of Silicon Valley. 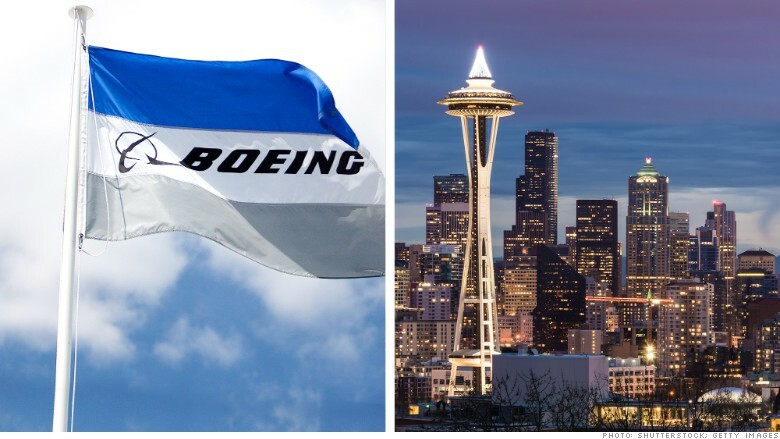 Seattle has Microsoft (MSFT) and Boeing (BA). But third-place Wichita? That city hosts major manufacturing facilities for makers of smaller aircraft, including Bombardier and Cessna. Palm Bay, Fla., with its proximity to Cape Canaveral, is home to several aerospace companies as well as makers of audio and visual equipment -- an outgrowth of the navigational and communications equipment used in space travel. Detroit gets high marks for its diversity. In addition to autos, the city has robust advanced battery and software industries, among others. "The best-positioned cities have specializations in multiple areas," said Mark Muro, a senior fellow at Brookings' Metropolitan Policy Program. Brookings identified 50 advanced industries nationwide. In addition to the ones above, they include pharmaceuticals, oil drilling, architecture and chemicals. The pay is good -- $90,000 a year on average -- and the growth rates high. These advanced industries have been adding jobs at nearly twice the rate of the overall economy since 2010. Best of all, not everyone needs to be Einstein. Less than half the workers in this sector have a bachelor's degree. "You need someone to operate the machines, to run the systems," said Muro. 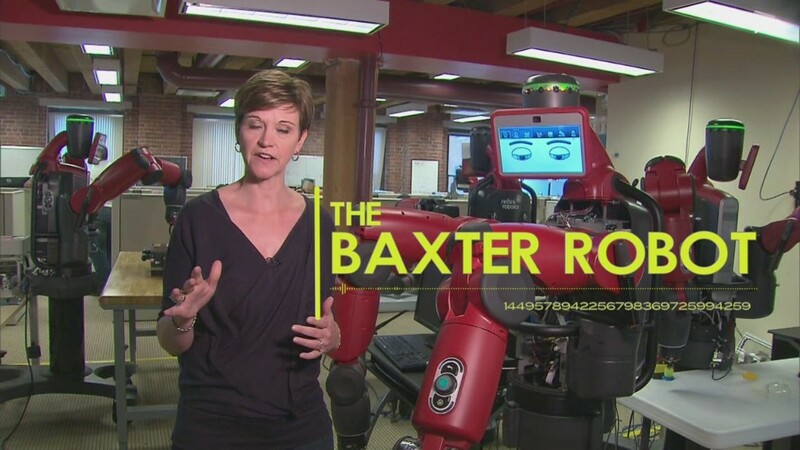 "The opportunities are here, if you have the technical training." To help match workers to job openings, the report recommends greater collaboration between private employers and educational institutions to make sure that what people are learning in school are actually the skills that regional employers need. It also called for greater cooperation between the public and private sector in R&D, as well as investments in things like educational institutions, testing facilities and business incubators in the metro regions where these advanced industries are located. "It's all a way to knit together actors who have not been communicating as well as they could," said Muro.